Cynthia and George Mitchell hosted the first Tremont House Ball on Feb. 16, 1985 in conjunction with the revival of the city’s celebration of Mardi Gras in Galveston. The ball premiered featuring live entertainment by the Jim Cullum Jazz Band, Russell Jackson and Brennan’s Bunch. Tremont guests then witnessed the “first” Knights of Momus Grand Night Parade as it traversed the street in front of the hotel. The mile-long parade themed as a “Salute to the Age of Mythology” and drew an estimated 75,000 people. Offering nine floats and numerous marching bands, the magnificent parade was led by legendary jazz musician Pete Fountain. Thirty years later The Tremont House, A Wyndham Grand® Hotel, continues this annual tradition by transforming the entire hotel for this legendary ball. This year, The Tremont House celebrates “Pearls and Prohibition” featuring swing and jazz music by Austin singer Danielle Reich and the renowned Dr. Michael White Jazz Quartet from New Orleans. A dinner buffet and prohibition-inspired cocktails will be offered in the hotel during these performances. Later, the party moves outside for VIP viewing of the Knights of Momus Grand Night Parade including a total of 55 floats and bands. Following the parade, guests make their way to the Tremont Ballroom for more cocktails and a memorable performance by Retro-Swing Band Poppin’ Daddies, finally a Midnight Breakfast is served to revelers as they wrap up the evening. In the past 30 years the hotel has celebrated Mardi Gras with various themes including salutes to Hollywood, Broadway, and the Circus as well as Parisian Nights, Venetian Nights, Cosmic Carnival, Carnival de Brazil, Viva Espana, Viva La Noche, the Enchantment of India, Chinese New Year and many more. The most recent balls include 2013’s “Waltz Across Texas” highlighted by a performance by Asleep at the Wheel and 2012’s “The Golden Era of Motown” with The Legacy of the Temptations presented by Legends in Concert. Tickets are still available for The Tremont House 30th Annual Mardi Gras Ball celebrating “Pearls and Prohibition” on Saturday, March 1. For tickets, call (409) 763-0300 or purchase ball tickets online at www.Galveston.com/MardiGrasBall. Event information is also posted at www.Facebook.com/TremontHouse. Mardi Gras, the traditional festival of feasting and merrymaking that precedes the season of Lent, was first publicly observed on Galveston Island in 1867. Following a sabbatical imposed in 1941 by war and challenging times, Mardi Gras! Galveston was revived in 1985 by the late Galveston-born preservationist and developer George P. Mitchell. The largest celebration of its kind in Texas and the third largest in the nation, Mardi Gras! Galveston draws more than 300,000 attendees annually, bringing the island’s streets to life with parade viewers shouting for beads, lively tunes played by colorful marching bands, and the infectious merriment that dominates the island for two full weeks. For more information on Mardi Gras! Galveston visit www.mardigrasgalveston.com. 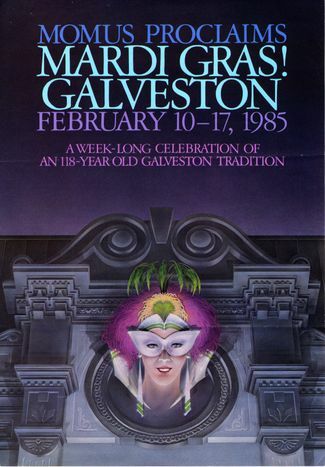 Official Mardi Gras poster from 1985 with The Tremont House building facade featured prominently. Courtesy of Rosenberg Library, Galveston, TX.